Follow @mcphoo Tweet In strength training, research has looked at the question of "how many sets" to make a difference for strength - does it matter if we train with 1 set or multiple sets? Most research of late has put the strength question to bed: more sets = more strength. What is less known is the relationship of hypertrophy to strength development. 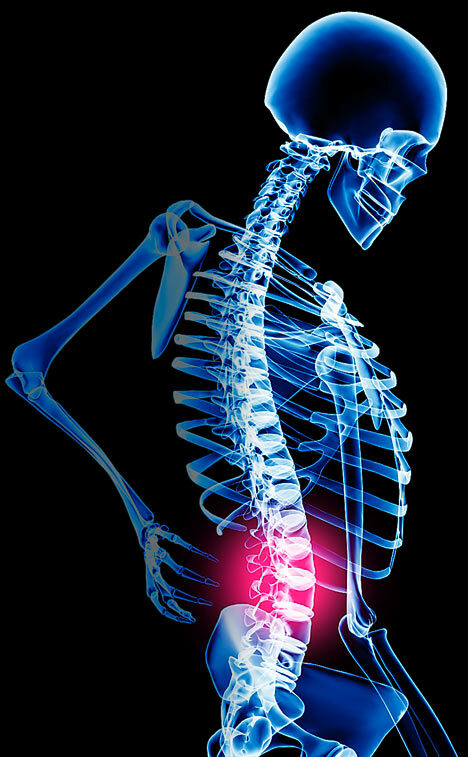 Strength is about at least two things: neural adaptations - muscle firing patterns - to be able to lift stuff, and structural changes to be able to support these loads without tearing ourselves apart. The latter is generally known as hypertrophy. So an open research question has been: are the changes in real strength more about the neural side of the fence than the structural? According to work done to review a TON of studies that have ever bothered to measure hypertrophy along with strength, more seems to be better here, too. In other words, hypertrophy is playing a side-by-side roll in strength training. At least as far as we can tell from eligible studies. The juicy bits are highlighted. Previous meta-analyses have compared the effects of single to multiple sets on strength, but analyses on muscle hypertrophy are lacking. The purpose of this study was to use multilevel meta-regression to compare the effects of single and multiple sets per exercise on muscle hypertrophy. The analysis comprised 55 effect sizes (ESs), nested within 19 treatment groups and 8 studies. Multiple sets were associated with a larger ES than a single set (difference = 0.10 +/- 0.04; confidence interval [CI]: 0.02, 0.19; p = 0.016). In a dose-response model, there was a trend for 2-3 sets per exercise to be associated with a greater ES than 1 set (difference = 0.09 +/- 0.05; CI: -0.02, 0.20; p = 0.09), and a trend for 4-6 sets per exercise to be associated with a greater ES than 1 set (difference = 0.20 +/- 0.11; CI: -0.04, 0.43; p = 0.096). Both of these trends were significant when considering permutation test p values (p < 0.01). 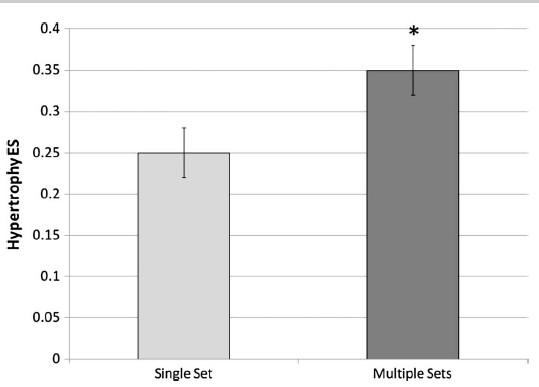 Mean hypertrophy effect size for single vs. multiple sets per exercise. Data are presented as means 6 SE. *Significant difference from 1 set per exercise (p <0.05). There was no significant difference between 2-3 sets per exercise and 4-6 sets per exercise (difference = 0.10 +/- 0.10; CI: -0.09, 0.30; p = 0.29). There was a tendency for increasing ESs for an increasing number of sets (0.24 for 1 set, 0.34 for 2-3 sets, and 0.44 for 4-6 sets). Sensitivity analysis revealed no highly influential studies that affected the magnitude of the observed differences, but one study did slightly influence the level of significance and CI width. No evidence of publication bias was observed. In conclusion, multiple sets are associated with 40% greater hypertrophy-related ESs than 1 set, in both trained and untrained subjects. 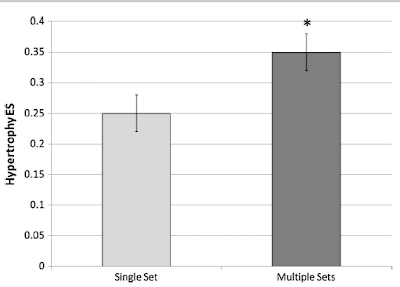 In a previous meta-analysis on strength using an identical statistical model, a 46% greater ES was observed for multiple sets compared with single sets (23) (Figure 3). A 40% greater ES was observed in this study. This indicates that the greater strength gains observed with multiple sets are in part because of greater muscle hypertrophy. This is a nice finding: hypertrophy - structural changes in muscle - seems to go hand in hand with strength, and right from the start of training. This is interesting in no small part because changes in measurable muscle size seem to lag behind measurable differences in strength. Dose-response effect of set volume on strength from Krieger (23). Note similarity to dose-response effect for hypertrophy in Figure 2. Data are presented as means ± SE. ES = effect size. *Significantly different from 1 set per exercise (p < 0.001). It has been proposed that the majority of initial strength gains in untrained subjects are because of neural adaptations rather than hypertrophy (28). The results of this analysis suggest that some of the initial strength gains are because of hypertrophy. Given the insensitivity and variability of hypertrophy measurements, it is likely that hypertrophy occurs in untrained subjects but is difficult to detect. This is supported by research that shows increases in protein synthesis in response to resistance training in untrained subjects (24). Recent evidence also shows measurable hypertrophy after only 3 weeks of resistance exercise (38). What the studies do not discriminate about is whether these hypertrophic adaptations are more myofibrial or sarcoplasmic. And that rather makes sense as the main consideration has been (1) strength and (2) simply whether or not hypertrophy is more or less corelevant with the development of neural adaptations that lead to strength. 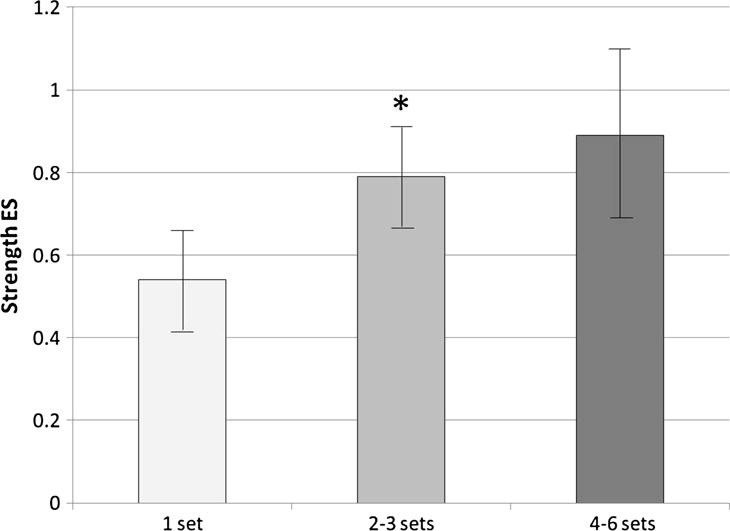 Multiple sets per exercise were associated with significantly greater changes in muscle size than a single set per exercise during a resistance exercise program. Specifically, hypertrophy-related ESs were 40% greater with multiple sets compared with single sets. This was true regardless of subject training status or training program duration. The second point is that those multiple sets make a statistically significant difference in terms of the amount of hypertrophy. More is more (at least up to 4-6 sets) for strength and structural development. There was a trend for an increasing hypertrophic response to an increasing number of sets. Thus, individuals interested in achieving maximal hypertrophy should do a minimum of 2-3 sets per exercise. It is possible that 4-6 sets could give an even greater response, but the small number of studies incorporating volumes of ≥4 sets limits the statistical power and the ability to form any definitive conclusions. If time is a limiting factor, then single sets can produce hypertrophy, but improvements may not be optimal. More research is necessary to compare the effects of 2-3 sets per exercise to ≥4 sets. Future research should also focus on the effects of resistance training volume on protein synthesis and other cellular and molecular changes that may impact hypertrophy. For beginners interested in doing more sets, excellent. What to watch out for: fatigue. Stay fresh. Might be a grand idea to make sure to get a program that waves the volume so that there's ample recovery. Without that recovery, growth in strength/hypertrophy does seem to get retarded pretty fast. For more experienced trainees, from what i hear among the folks i work with is: want to get bigger? 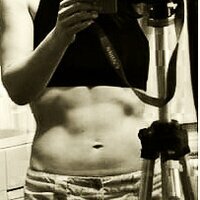 lift more. More sets. more reps. more more more. The question this article nicely raises is what's an optimal more? Will be interesting to see if, when and how this question is formally explored in the future. What is the Pump, really? Do we know? Supplement Curmudgeon: Does this stuff work?